Having spent twenty eight days at home on sick “Leave of Absence,” disease Jaundice, which proved to me one of the happiest periods of my life (though not entirely free from gloomy and sad reflections, particularly because of the recent death of my very dear and true friend, with whose family I am intimate, and the members of which are now sad with the burdens of their many afflictions) the time for my departure had arrived. By the kindness of one very dear to me, I was provided with a private conveyance to High Point for which place I left home and all its endearments at ½ past 7oclock Sunday morning, Sept 13, 1863. My friend, Mr. Ch. T. Pfohl, accompanied me in the carriage. At High Point we met with Mr. Henry Fries, who returned in the conveyance that brought me down. The train had been delayed the previous night, and soon after I reached the station it arrived about 12 hours behind schedule time. The detention was caused by the passage of Longstreets Corps of troops from Gen’l Lee’s to Gen’l Bragg’s army. Upon the train I found Colonel Bennet of the 14th Reg’t NC Troops with whom I traveled as I came homeward. He was returning, recovered from a wound received at Gettysburg, Pa. He informed me that during his stay home he had married, and although he had received an extension of thirty days, he was returning to his command with the extension in his pocket! A wonderful man! In consequence of the continued trains of troops passing Southward, our progress was slow, consequently we failed to make connection at Raleigh with the train for Gaston. We reached Raleigh about midnight, and having learned that a train for passengers would not leave before 10 o’clock AM the next day repaired to Exchange Hotel where we were provided with a good bed and excellent breakfast next morning. Source: Diary of Dr. John F. Shaffner, Surgeon 4th Regiment NC State Troops as found in Christopher Watford, ed. The Civil War in North Carolina: Soldiers’ and Civilians’ Letters and Diaries, 1861-1865, Volume 1. Original in the North Carolina State Archives, Raleigh, NC. Once more I am permitted an opportunity of sending you a letter. We have been from any mailable location so long, that no chance of sending occurred until now. By my heading you will perceive that we are at last in My Maryland. The events of the past three weeks would require much time to describe. I cannot do so fully, but will endeavor briefly. When last I wrote it was to Miss Mollie, this day three weeks ago, from Rapidan River, near Orange, C.H. We remained there a few days, ‘then started in pursuit of the enemy. We reached Rapphannook River but found the enemy across, and his batteries commanded every available ford, we moved rapidly higher up, but with vigilance he followed us. A few days were thus lost to us. The following Sunday witnessed a severe Artillery duel across the river, our Brigade supported several batteries. We had a few men killed and wounded. Monday morning at four we started on a rapid march and by ten at night had accomplished more than 28 miles. No one knew whither we wer egoing, but all knew that Jackson was aiming a bold blow in some direction. Four o’clock Tuesday morning we were again on the tramp, and had not proceeded far before we reached Salem, a town on the Manassas Gap Road. Here I first had an idea of our proposed destination. With Broad Run station, through Thoroughfare gap, Hay Market, Gainesville, and by night the head of our column had possession of Manassas Junction. Here after a short engagement, we captured immense stores, consisting of provisions and equipments, also some 6 or 8 pieces of Artillery. We had had nothing to eat for 24 hours, and here we found abundance including many delicacies. Our men supplied themselves with all they could carry, all captured wagons were loaded, and the remainder was then burned. Our Brigade got about $25,000 worh of Medicines—I got two horses. Wednesday night we marched upon and took Centerville. There we rested until noon, when we commenced our march backward. Jackson had about 20,000 men—the enemy in large force under Pope, lay between us and Longstreet to intercept us. McClellan with an immense army was marching upon us from Washington.—About four o’clock Thursday evening the battle opened, and raged furiously until about 10 o’clock. All was quiet for the night. Neither side had gained any advantage. Friday all day the battle raged, yet still against tremendous odds, we held our own. Longstreet should have arrived Friday morning but where was he? Would he come in time? Could we hold out until then? These painful questions occurred to me hundreds of times. Late Friday evening the distant “boom-boom” of cannon was heard upon our right.—We all understood it.—A Joyous shout rose from our lines—“Longstreet has come,” “Longstreet has come,” was the universal exclamation of delight. He had indeed arrived with 30,000 fresh troops. Soundly we slept that night. All must be well on the morrow.—By early dawn the fight was renewed—& before sunset we remained victors on the field of Manassas, rendered famous a second time. The confused and routed masses of the enemy were rapidly falling back upon Washington. Many prisoners were taken, thousands of small arms, an umber of cannon and many other stores. His dead and wounded literally covered the ground. Sunday we employed in burying the dead, caring for the wounded.—I had plenty to do, being the Brigade Surgeon. Monday evening we had another fight near Farifax C.H., which resulted again in our favor. Our loss in this series of engagements will not exceed 5,000. The enemy admit 15,000. In the 21st, Col. Fulton was killed, Major Graves painfully, but not mortally wounded, Lts. Jackson & Owens killed, Capt. Hadly & Lt. Miller wounded in hands. Sergt. Shepperd sounded. Sergt. Copeland, Donell Wright, Old town Gus Butner killed—none other that I have learned. Sam is unhurt also Capts Pfohl and Miller. Col. Hoke is wounded in hand, our two remaining Captains also wounded. We lost quite severely, being engaged in every fight. General Pender was slightly wounded, but is now with his Brigade. General Ewell lost a leg, and is reported in Critical condition. General Trimble wounded. On Friday we crossed the Potomac into Maryland & yesterday occupied this city, which has a population of some 12,000. The people are mostly glad to see us & hail us as deliverers. We have certainly made a tour of conquest, the most remarkable in history. Our troops are enthusiastic & under Lee and Jackson invincible. Will not our enemy now make peace? Must we again & Jackson demonstrate our invincibility? Time will show. I sent the receipt for pills to your mother, but fearing they may not have reached you, I will give it again extemporaneously. Perhaps the two differ slightly but their effect will be the same: Blue Mass—60 grains, Calomel—30 grains, Rhubarb—20 grains. Make it into 30 pills of which one to two make a dose. Please give my kindest regards to your parents and Miss Mollie. Also to the others of the family. I would write more but time presses. We know not our destination, but think its onward. Address letters to Gordonsville. Let me enjoin upon all to take good care of yourselves & remain well. Surely our prospects are bright enough now to give joy to every heart. If I could communicate with loved ones at home more frequently than our opportunities allow, I would be better pleased. I am quite well. Write early as convenient, and believe me as ever. Sources: Christopher Watford, ed. The Civil War in North Carolina: Soldiers’ and Civilians’ Letters and Diaries, 1861-1865, Volume 1. (Jefferson, North Carolina: McFarland & Company, Inc., 2003). Original in the Shaffner papers, North Carolina State Archives. Yours of recent date came in on Sunday last, and on the same day I wrote to Gov. Clark as you desired. My letter was handed to the Surg. Gen’l. with what particular instructions, I am not advised. Now I have before me the result of the application, not satisfactory indeed, but perhaps the best that can be done just now. To be young may sometimes not work in ones favor, yet rejoice in your youth, nurse it well, so that old age may not overtake you at forty-eight as it has done me. Dr. Charles L. Johnson S.G. N.C. writes in reply to my letter to Gov Clark thus: “Your young friend Shaffner shall be taken care of, but not exactly as you desire. The sureons for the Regt. now forming at High Point have been appointed. Then he cannot get in there; nor can I give him the place of full surgeon; but I will place him next in rank, and this I will do in a few days.” The success of your hospital has been very cheering to us. It is indeed the only oasis that we have discovered in the desert of destruction in which the ill-fated 11th has been doomed to wander the past three months. I trust that a brighter future awaits it. Its holding so much material that I highly prize, has caused me much solicitude. This together with the great anxiety I have and “cannot banish” with regard to the condition of our Country at times wears injuriously upon my nerves. But for this, I think I would be a well man. The time has been when I could throw dull care “to the dogs.” Even now I can readily manage all minor ills, but this great evil I cannot banish out of my sight. If we are but true to ourselves all must eventually come right, but the suspense, the anxiety, the suffering, the anguish that will wring the heart of the nation until that is accomplished, sicken me to contemplate. That Sam and Alf have kind friends to minister to them when they require attention is peculiarly gratifying to us, and we hope that by this time they are again restored. I ought to write to Henry B. but know not where not to address him. The mail is looked for daily with much interest, and letters “from Camp” are always the first to be opened. We feel that we are on the eve of great events, this suspense between hope and fear causes us to breathe more freely when the mail opens and discloses no reverse to our arms. Would to God it could again cheer us with the news of a Manassas victory. Source: Shaffner Papers, North Carolina State Archives, Raleigh. I was anxiously looking for another letter form you, when Friday evening’s mail brought your’s of the 11th. I intended answering yesterday, but several things prevented. There were some business letters to write, and then Sunday is a good day for the neighboring people to pay us a visit. ‘Tis the Turners, Skinkers, Hendersons, Beverylys &c., who together represent the wealth, part of the intelligence and beauty of this neighborhood. The visits of these people are quite frequent and they must therefore be attended to, and treated hospitably, which task is- to me- an unpleasant one. But however great their pretentions, are not doing as much practically as some others less favored with wealth and self assumed aristocracy. Alf, by the way is doing remarkably well, considering his recent trouble. He speaks of returning to Camp, but I have given him to understand he is not the one to say how soon or when. Sam is almost well, a little sick yet. He is still staying in my room. We had the misfortune to lose three men by death last week. Two were from the Rifles – they belonged to the Rockingham Company. Capt. Boyds. There is now a Stokes man with Typhoid Pneumonia, who I fear must succumb, the names of those from Alf’s Camp, were Chas. D. Pettus, and Foster Phillips – Boyd’s man was named Horton. Pettus had Fever but died from exhaustion produced by excessive hemmorage. Phillips had measles more than two months ago, which brought on a Consumption that ended in death .. – Boyd’s man also had had measles, then took Fever that proved too much for a system already reduced. We have lost 5 men in three weeks out of a total number of 81 patients. The percentage is not as large as in General Hospitals, nor on private practice. The “lady nurses” are enjoying good health and continue doing good service. I am always uneasy they have more to do than they can stand up to, yet trust my apprehensions are not to be realized. The young lady you question me about, which questions I cheerfully answer to you – has greatly disappointed me in adapting herself to surrounding circumstances. Whether she is sick of this life or not, I have not reason of saying, but judging from a cheerful exterior, she is contented. When I first heard of Salem ladies coming to nurse, I greatly feared a patriotic enthusiasm might have induced yourself, Miss Mollie or my sisters to volunteer services, I should have been very sorry had it been so, however glad I would be to see you, in in what estimation I hold your accomplishments in nursing the sick and suffering. I would not exactly consider a Hospital of sick soldiers, indiscriminately composed of all character, a very suitable place for a young lady, and would not wish either sister or particular friend to enter one. Does this answer your question. I have heard considerable talk about the “Little Revolution,” as Miss Mollie has so well termed it. My sister Lou, in her last letter to me was very indignant and exhibited considerable feeling. I always believed, even from the beginning, that our clergy were and would be unsound in this contest, and of the man in question still hold a similar opinion. Until better men assume control of the Moravian Church I hold myself aloof, a determination sometime aimed at. It afforded me pleasure to see the proceeds much greater than might have been but for this opposition, and trust the same hostility may be exhibited hereafter to such efforts, since by this means they are rendered more popular and interesting. Messrs. Bele, Masten and Hall are still here, and I know not when they can get away. ‘Tis not probable that they can do so soon. PS Wish you could see my “Yellow Flag!” I am ashamed of the necessity and the duty that calls me to seek protection under it. The very sad reports from your Regiment including the information that you had also fallen a victim to disease has thoroughly aroused this community. Still some of us, whilst fearing the worst, yet hope that the pictures have been painted in colors too dark. A corps of nurses is about starting to your relief, and boxes innumerable have been packed to send along. We have just closed one containing a barrel of whiskey, a quantity of fruit, and several tributes of love and affection from different parties on the lot to the dear ones abroad. These packages are labeled and explain themselves. The box marked to you individually was put up by Mrs. E.A. Vogler and my people for your especial benefit imagining you all the time on a bed of sickness. I hope they are mistaken. Articles not marked are intended for you, Sam and Henry especially, and our friends in general, not forgetting the boys that volunteered out of our employment. For the whiskey we pay $1.00 a gallon, say 39 gal. $39.00. This you may collect from the “Hospital fund,” if there be any, and the proceeds of such collection you will add to a small fund I this day placed into the hands of Henry Holder Esq. which fund is to be disposed of by you, Mr. Holder, Henry Barrow and Sam James jointly. If the distress and destitution be as great as is represented by some, I have divested Mr. Holder to advise me at once, and I will gladly forward more funds if that can give relief. You know that I find no pleasure in feasting on imaginary ills, yet I must confess that the silence of yourself, Mr. Barrow and Mr. James appears ominous and makes me feel sad. Letters from the dear ones near Manassas are looked for with painful anxiety. To know the worst would be less excruciating than this suspense. So if you, or all of you are sick or too busy to write, have somebody else to write us. Surely Mr. W. Pfohl would do so if requested. Show this to Sam and Henry and all of you be assured that you and your condition is the absorbing theme of thought and conversation. Carrie Fries wrote to Dr. Shaffner and described her sister’s “Confederate Apron” as a way to demonstrate dedication to the Southern Cause. 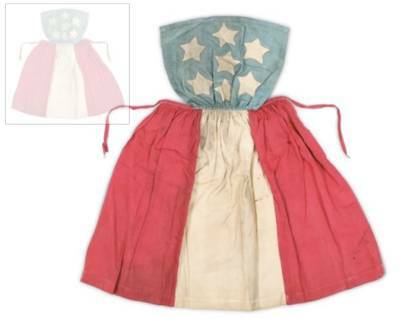 Follow the link below to learn more about a Confederate Apron in the collections of the Museum of the Confederacy in Richmond. From Carrie’s description and the image of the apron, it seems the only difference might be in that the Salem, NC apron had yellow stars instead of white ones. Having heard through other letters how many were sick and looking to you for help, I was fearful our time would be so much occupied that we need not look for a letter for some time. I was consequently all the more rejoiced to receive your nice long one of the 1st. inst. I was sorry to hear that you have so little help from the Assistant from Richmond. I hope by this time Dr. Tanner is with you. Let me make one request. Do take some care of yourself, because even if Manassas &c. have no terrors for you, still there is such a thing as your breaking down possible. I have just read the above to mother, and she says I shall tell you it is good advice. I did not intend to presumptuous to advise, but merely wished to remind you that your constitution is not of iron & may give way under constant anxiety & care. I hope Mr. Willie Pfehl has entirely recovered. He no doubt was rejoiced to see you. Mr. Barrow wrote me that you were tenting with them. I saw Charley Bahnson at a distance this morning. Capt. Wheeler was talking with him, perhaps he was trying to get a new member for his company. Mr. Meinung is quite sick to-day. I guess you have heard all about him from home. Addie Chitty came home with her brother & old Mr. Blum. She is said to be in the last stages of consumption. I was introduced to Mr. Blum—as a Indianian—this morning, but he objected, as he says all persons from the North and West are looked upon as abolitionists here, and that he never gave aid or comfort to any Black Republican. Today Mollie went to school with a “Confederate apron” on. I wish you could see her wear it. It is made of very bright colors, the three bars form the apron and the body is made of blue with twelve yellow stars in a circle. When we commenced making it, I thought it would look gaudy and out of place, but since it is finished it really makes a very pretty and neat appearance. Father admires it exceedingly. He wanted her to wear it to church yesterday, but she was afraid she would disturb the congregation. She is making quite a show of her devotion to the Southern cause, but it is not all show, for she works for the soldiers in every spare moment she has. We are all knitting and soon as she finishes one thing she has another on the needles. Mrs. Nutt from Haw River has been spending several days with us. She is a fine lady and I enjoyed her visit very much. The task however which I had intended should be completed by this time is not finished, and I must work all the harder this week to make up for lost time. My share for the volunteers must be ready before the cold weather. This whole morning was spent in walking over the Academy grounds, Museums &c., and this evening I have such a headache from it that I shall not be able to do much, but tomorrow I will begin again in good earnest. Don’t forget to let us know what is most needed to make the sick more comfortable. There is a case of measles in the Academy. One of the girls traveled with some soldiers who had them and took them. Emma has never had them, but father says she shall not stay from school for fear of taking them. He thinks it is really criminal to keep children from the when small, and subject them to the suffering we are daily hearing of, by their having them in after life. His health is about as it was when you last saw him. The rest of the family are well. Give my best respects to Alf, Mr. James, Mr. Barrow, and Mr. W.J. Pfohl.